The car park is a long walk from the house and itself is approached down a long narrow lane which leads off the main road and I would say therefore Chastleton is officially in the middle of nowhere, but what nowhere! The track from the car park winds down the hill and the house hoves into view after a while looking like a giant tardis sitting in the middle of open countryside. As you approach nearer you see the parish church to the right, which was serving tea and cake in the graveyard on the day I visited with all profits going to provide a new classroom at the local primary school. 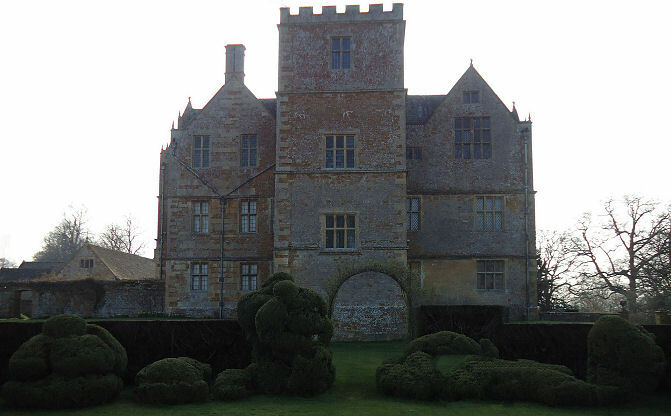 You then enter through some imposing gates and into the first courtyard where the front of the house towers above you in all its Jacobean glory. There is some association with the Gunpowder Plot in that the house on the site originally belonged to Robert Catesby one of the conspirators but it was sold in 1604 a year before the attempt to blow up parliament. 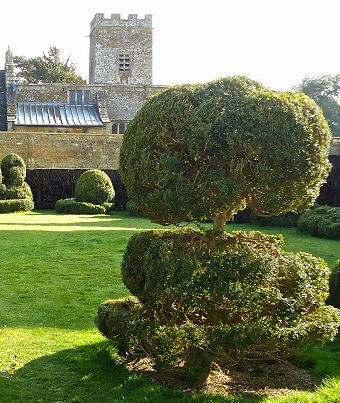 The new house now owned by a wealthy wool merchant called Walter Jones began to be built in 1607 out of Cotswold stone and it was finally completed in 1612. 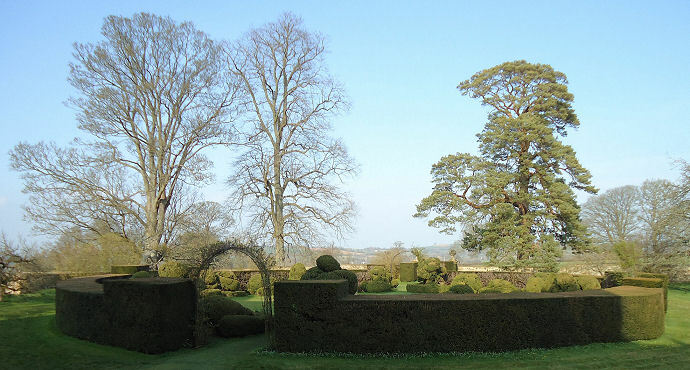 The gardens are approached through a small arch in the brick wall and you immediately come to a ledge overlooking the topiary ring in the dip below. The ring is of yew with box specimens all around the inside. At one time this space was private and only the high ranking members of the family where allowed to go in I(and a few trusted gardeners one assumes). 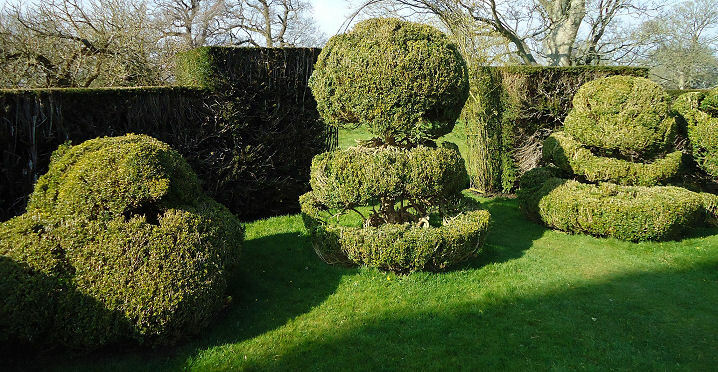 Over the years the whole garden inside and outside of the ring suffered neglect and the box topiary specimens which were one recognisable as horses and other animals grew and grew into the amorphous shapes which you see today. 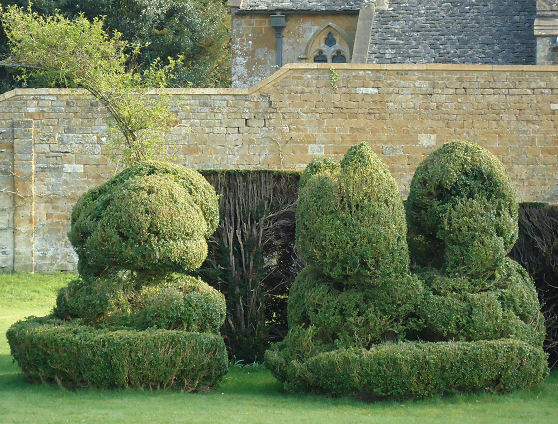 A decision has been taken to reform the box topiary but not to try and recreate the original animals most of which have been lost to the ravages of time. 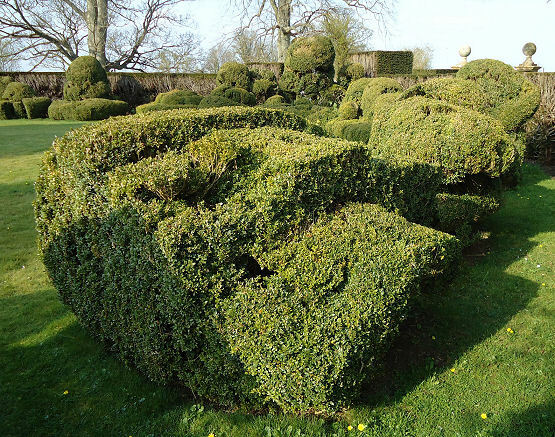 There is use of yew hedging in other parts of the garden especially as you move towards the section which is being used as the large kitchen garden and the Trust are recreating areas such as the servants garden to the side of the house. The whole gardens are easily walkable in half an hour today although the estate at one time was vast. You could, of course, spend much longer there if you wish as it is an incredibly tranquil spot and about as English as you can get. The Trust have recreated a full sized croquet lawn where competitive games are held.